Thanks to Judith Duncanson and Dade Dudgeon who took all these excellent pictures. 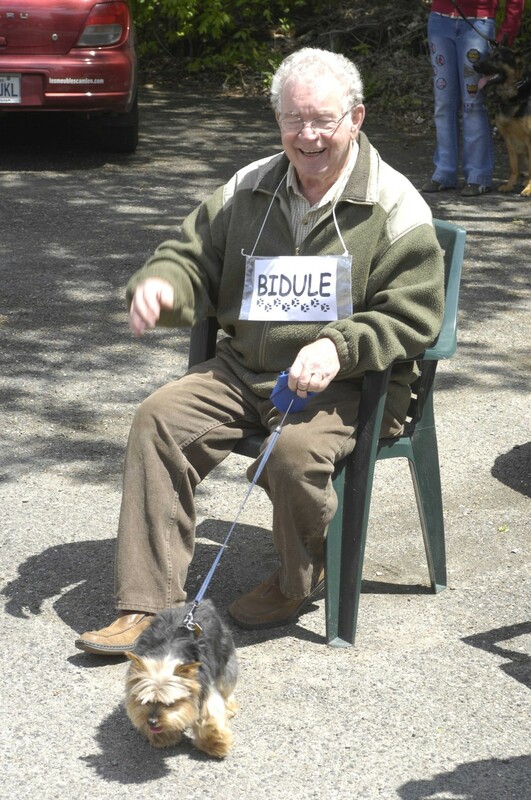 The Dog Show in Knowlton was held recently and as always was quite an extravagant parade of pooches and proud puppy owners who got to strut there stuff and show-off their best behaviour to large crowds who lined Lakeside and happily watched the event in the Park beside the Mill Pond. 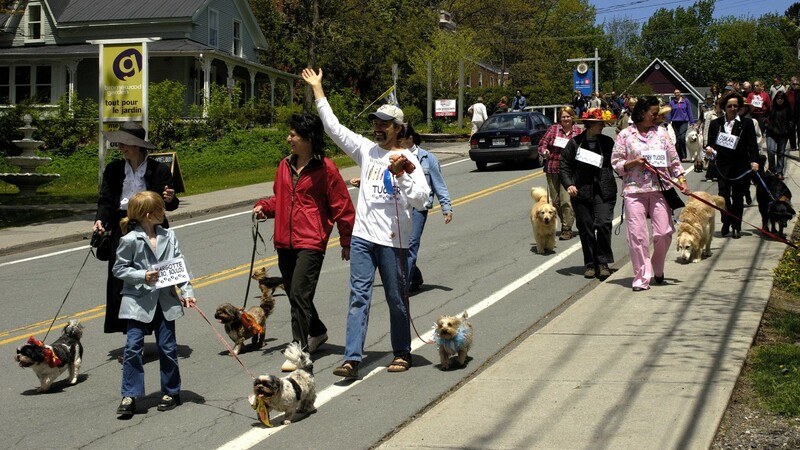 The annual event helps raise funds for the SPCA Monteregie and for the Frontier Animal Society. Not only that it helps raise awareness to the plight of homeless and abandoned animals and the hard working volunteers of the SPCA and animal shelters everywhere deserve to be thanked for all they time they give to help the creatures in our midst who rely so much on our care and affection. This picture is of Marie and Sasha - a recently retired Mira dog. 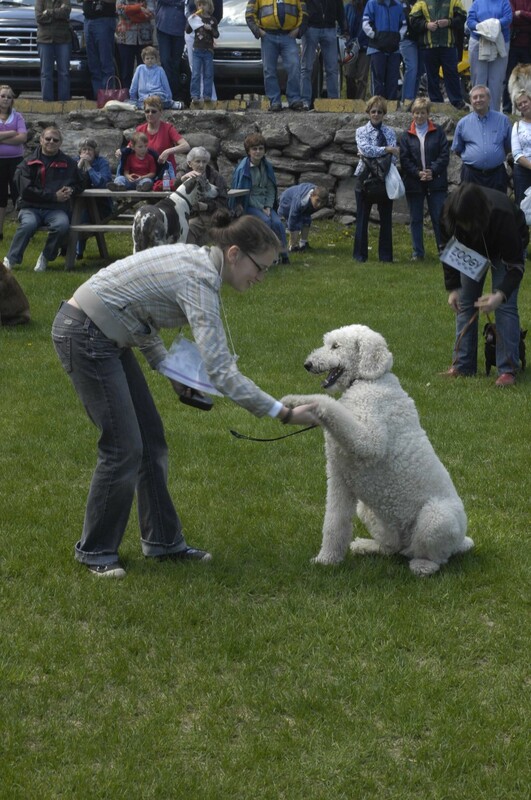 This was the 7th annual Dog Show and is the well known celebration of our four-legged furry friends in Knowlton. Residents get to cast votes for the “Best in Store” dog which gives us a chance to vote for our favourite store dogs! Knowlton is the kind of town where store owners often consider their dogs as one of the family and we often see a comfortable canine lounging in the corner of a boutique. The local shop dogs are always enjoying the people shopping and are more often than not soliciting a pat on the ear or a scratch of the belly! In a small town like Knowlton most of the residents know the dogs by name and the puppies seem to appreciate the friendly attitude as much as their owners! 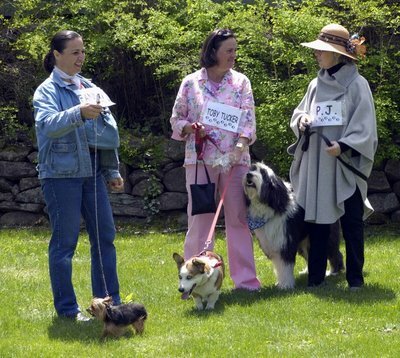 This picture shows the three top dogs and their proud owners from left to right: Sonya Frechette with Fanny, Heather Heath with Toby Tucker, Jean McLeod with P.J.! Congratulations! The dog show also gives proud parents the chance to enter their dogs into the "Open Invitational". The crowds gathered in the park and the dogs were on their best dressed behaviour. You could see the pride in the owners as every dog had his moment in the spotlight; shaking a paw, doing tricks or just plain looking cute! Of course the funds raised go to a good cause but the best part of the show is seeing how much love and joy dogs bring into our lives! Thanks to Judith Duncanson and Dade Dudgeon for his excellent pictures! Visit Dade Dudgeons website to see more great photographs from the area.